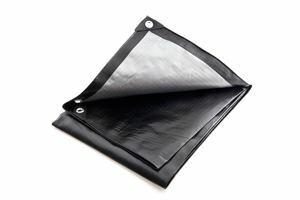 The Black / Silver Heavy Duty tarps are fabricated to 270gsm and a 16 x 16 weave count. Chunky 20mm brass eyelets are fitted at 50cms intervals, and each corner is fitted with a 3-rivet reinforcement patch. Our 270gsm tarps are manufactured with a black top hemmed onto a silver underside; there is a 3% UV inhibitor in the lamination. Although fabricated from a heavy weight polyethylene, these hardy covers remain manageable and easy to handle, and are fully waterproof. Popular as roofing covers and boat tarps. 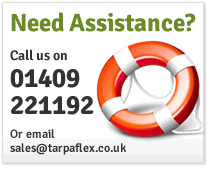 Each Black / Silver 270gsm tarpaulin is sold with a limited 18 month warranty against UV failure. 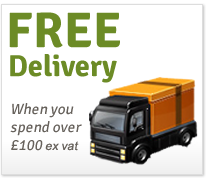 The warranty is subject to use in UK conditions only, and does not cover wear and tear or weather damage, but warrants the cover against UV failure for 18 months from invoice date. Please click here for more information. Looking for more details? Visit our Product Info page for information on the construction and manufacture of this tarp, and handy tips for usage. 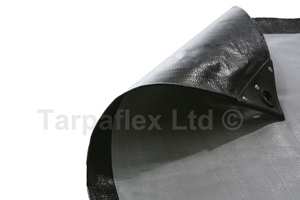 Our Black/Silver tarpaulins are produced to finished size. There can be a slight manufacturing tolerance but we would not expect this to exceed 5cm. Most tarps will have a seam as they are fabricated by heat sealing several pieces of polyethylene together. 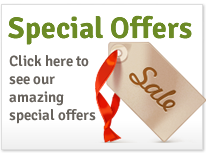 ORDER 7 PIECES - SAVE 10%!